Sharlene Habermeyer, MA has spent over twenty-five years researching the effects of music in the brain development of children. She is passionate about how people of all ages learn and how music is a catalyst for learning. She holds a Bachelors of Fine Arts (BFA) degree in Art from Utah State University and a Masters degree in Education from Pepperdine University, Malibu, California. In 1999, she started the Palos Verdes Regional Orchestra (now the Palos Verdes Regional Symphony Orchestra). It currently boasts over one-hundred members. 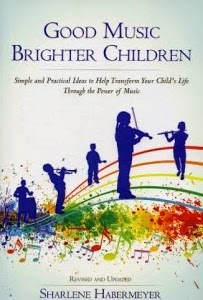 Sharlene’s initial inspiration for Good Music Brighter Children came from the extensive work she did with her severely learning disabled son, and finding that music was his strongest catalyst for learning she began passionately researching the effects music had on the developing and mature brain. A college instructor, a popular speaker, and a consultant, she is the mother of five boys and lives with her husband in Torrance, California. She has spoken at parent conferences around the United States including the Parents as Teachers Conference (PAT) and the Crucial Years Conference in Missouri. In August 2014, she will be speaking at BYU Education Week. $25 Amazon Gift Card or Paypal Cash Ends 10/15/14 Open only to those who can legally enter, receive and use an Amazon.com Gift Code or Paypal Cash. Winning Entry will be verified prior to prize being awarded. No purchase necessary. You must be 18 or older to enter or have your parent enter for you. The winner will be chosen by rafflecopter and announced here as well as emailed and will have 48 hours to respond or a new winner will be chosen. This giveaway is in no way associated with Facebook, Twitter, Rafflecopter or any other entity unless otherwise specified. The number of eligible entries received determines the odds of winning. Giveaway was organized by Kathy from I Am A Reader and sponsored by the author. VOID WHERE PROHIBITED BY LAW. Did you know that music has the power to increase your child's intelligence? Scientific studies at some of the most respected universities in the world indicate that children introduced to classical music at a young age read earlier and perform better on achievement tests. Inside, respected educator, Sharlene Habermeyer gives you a simple, step-by-step program that any parent can follow. You'll discover how introducing your children to good music can: accelerate language development, improve math and science skills, increase memory and concentration, improve reading comprehension and retention, enhance physical coordination and benefit children with learning disabilities and more. This book is a powerful guideline for any parent who wants to help their child develop into a bright, well-rounded and confident adult. This book reads like a textbook in the format and detail specific to each topic covered. I'm still studying it and have already been enlightened and encouraged in our choice to provide piano lessons for our daughter. We don't have experience with learning disabilities, but our daughter is beginning to understand the correlation between practice, perseverance, and success. I look forward to incorporating the strategies I learn from this author! We live in an age of instants: instant photocopies, instant food, instant photos, instant communications of all sorts, and more. Although many of these instants make our lives easier, they can also give our children a distorted view of life and how goals are achieved. Many children grow up expecting instant results in life, never learning to work for or wait for a reward. When things don’t come easily or immediately, they give up. For this reason, studying a musical instrument becomes a priceless lesson. As a child begins to learn to play the flute, for example, she soon realizes that this is not going to be done in an “instant.” It will take time, patience, perseverance, determination, and the ability to stick to the task, day after day, year after year, to play the flute with any degree of proficiency. Learning to read notes, to develop hand-eye coordination, to listen, and to count rhythms is a process involving perseverance. As she works through the difficulties and challenges of learning an instrument, she soon learns that determination and perseverance equal success. Likewise, the perseverance a child learns by practicing her instrument can be, as the experience of many demonstrate, transferred to other areas of her life. For instance, when subjects in school are difficult, she will continue to try her best until the assignment is completed, confident that eventually she will be successful. When life throws her a curve she will not give up, but will work harder with even greater diligence and perseverance until she reaches her goal. Although most of the great composers suffered personal adversity, they persevered and went on to write beautiful sonatas, symphonies, and operas. Beethoven, despite his progressive deafness at an early age, wrote perhaps his greatest music after going completely deaf. Bach suffered blindness and diabetes, yet continued to compose music. George Frideric Handel suffered a debilitating stroke that put him in a rest home. The world felt that a great life had come to a close. With dogged persistence, he shuffled his way to the organ each night after everyone had gone to bed, forcing his fingers to slowly play each key on the organ. The nuns who heard him were amazed at his unfailing courage and determination. Eventually, he made a complete recovery and went on to write many great pieces of music. For the past thirty years, I have had a particular interest in music’s impact on children with learning disabilities because of personal experience. In 1982 our third son, Brandon, was born. It was a traumatic birth. Born six weeks early, Brandon was too high in the birth canal, and as a result he was literally dragged out by forceps. He was an unhappy baby and cried all the time. He had constant ear infections that included a build-up of fluid in his ears, and despite being on daily doses of low-grade antibiotics, the infections persisted. Over time, this constant fluid buildup affected his hearing at a critical time in his development and caused him to experience sounds and language as if he was in a vacuum. I was reading to him daily, playing music for him, and taking him to “mommy and me” classes, yet his language and communication skills remained poor. After having him tested by a professional, we determined Brandon needed speech and language intervention. I naively thought once his language problem was fixed, everything would be fine. I was wrong—this was just the beginning. When Brandon was six, his kindergarten teacher expressed concerned about his ability to learn. He was not able to do the classroom work and seemed frustrated and distant. We had him tested both at our public school and privately by a child psychologist. The results were grim. Brandon was diagnosed with auditory processing, visual motor, visual perception, sensory motor, and attention deficit disorder. The difference between his oral IQ and written IQ was thirty-eight points, indicating severe learning disabilities. This team of experts told us that school would be very difficult for him. We were told that he may not graduate from high school, that college was out of the question, and that a trade school would be more appropriate. They said Brandon was “high risk,” meaning that as he got older, he could be a candidate for dropping out of school, experimenting with drugs, or worse. Why? Because kids need a measure of academic success. He needed to experience some kind of school success to increase his confidence level. But how do you help a child achieve academic success when he can’t read, write or spell? When he does not understand even the simplest of math concepts? When he has difficulty paying attention and following directions, and sports confuse and frustrate him? It was a daunting challenge, and in the beginning I was overwhelmed. I did not know the first thing about learning disabilities, but I was determined to find out and to help him because I wanted Brandon to love learning—not just for success in school, but for a rich and meaningful life….